We need you to survey your local waterway this summer! 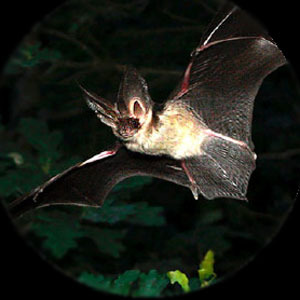 Join us for a free training session to learn how to survey for Daubenton’s bats. The training consists of a one hour presentation, one hour discussion of sites and a visit to a local waterway to demonstrate the survey method. Wear suitable clothing for night time outdoor work and sturdy footwear. Bring a torch and a bat detector if you have the use of one. All welcome. Please help clean up our area! 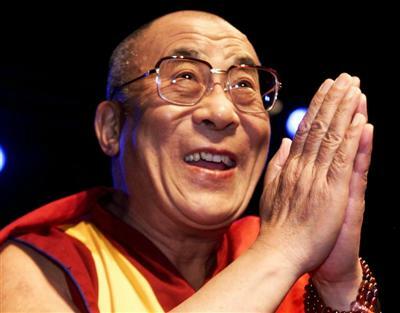 Every year at Jampa Ling the Dalai Lama's Birthday is celebrated and this special year everyone is invited to come and celebrate with prayers for his long life and good health. Starts at 10.30 a.m. If you are a musician please bring your musical instrument. Please bring lunch to share. on Wednesday 24th June at 9 p.m. Admission €10 adult Children Free! Lisnover/ Corneen / Bawnboy / Corlough / Ballymagovern. Geo-park Guide Oliver & Aidan Brady. 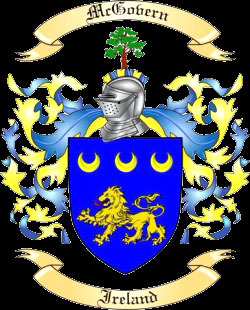 Swanlinbar (Mill Rd) / Tullydermot / Blackrocks Glangevlin (Old Brian Boru Rd) Shannon Pot / Burren / Blacklion / Redlion / Lough McNean / Tober Glangevlin. This Event is organised by: Bawnboy Heritage with the Assistance of Cavan County Council for Heritage Week. on Wednesday 16th July 2013 at 9 p.m.
Mass will be held at 8pm in St Mogue’s Church Bawnboy. 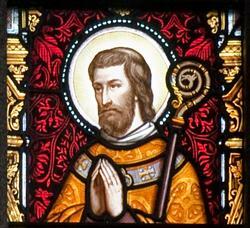 "The Life of St Mogue"
by Dr Brendan Scott in Templeport Resourse Centre. 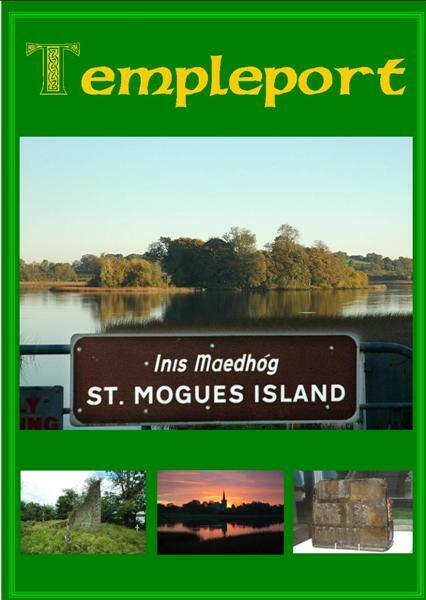 Boat trips to St Mogue’s Island on Saturday 1st February will start at 11am weather permitting and continue until last boat at 3pm. 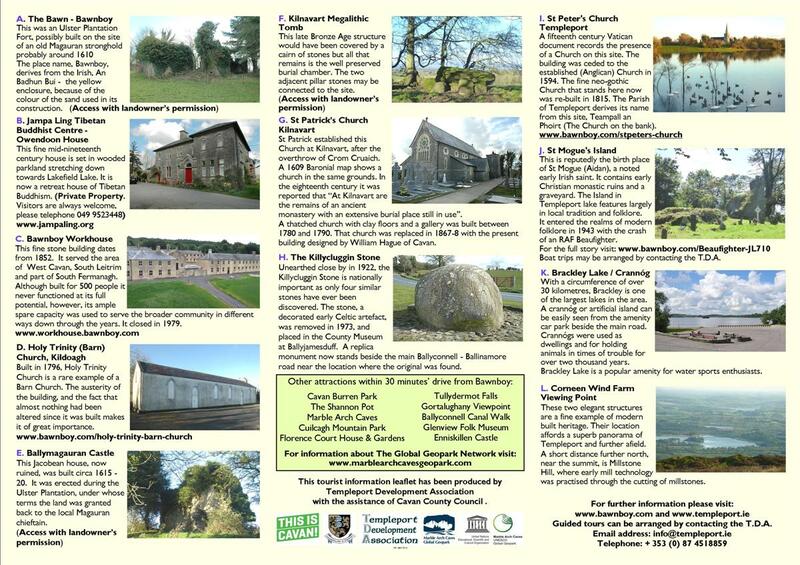 There will be a tour of Templeport Historical Religious Sites on Sunday 2nd February starting at 2 o'clock at St Mogue’s Church Bawnboy first to Jampa Ling, then Holy Trinity Church Kildoagh, St Peter's Church Port, and finally to St Patrick's Church Kilnavart. 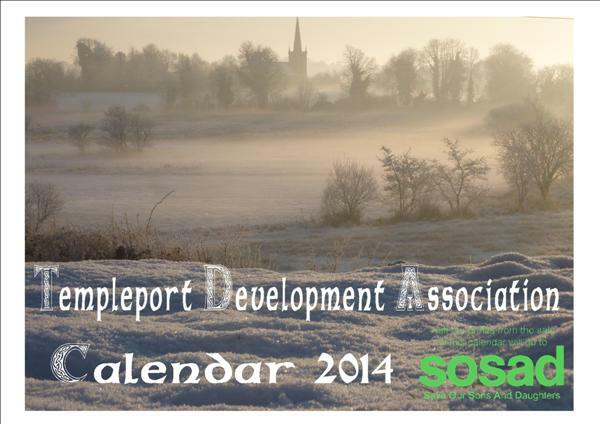 The Templeport Development Association have published their 2014 Calendar which this year is to support SOSAD (Save Our Sons And Daughters) the charity which supports families and others affected by suicide. They also have counselling services for depressed people. All their workers are volunteers and they receive no support from any government agencies. Please help them and buy a Calendar or two if you see them on sale. They are only €5 and should be found in the shops in Ballyconnell and Bawnboy! on Wednesday 27th November 2013 at 9 p.m.
From 2pm to 4pm you can explore the Island in the company of Geopark guides Oliver Brady and Aidan Brady and learn about the geology, history and folklore associated with the island. Monday 3rd June: Geopark guide and local historian Oliver Brady will take you on a fascinating tour of the Bawnboy workhouse. The meeting point is the Workhouse, Bawnboy, Co. Cavan at 12 noon. on Wednesday 5th June 2013 at 9 p.m.
on Wednesday 8th May at 9 p.m.
Click on the thumbnail above to download a larger image which should open in a new window. 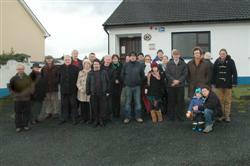 On Thursday 31st January 2013 the garda station in Bawnboy closed. 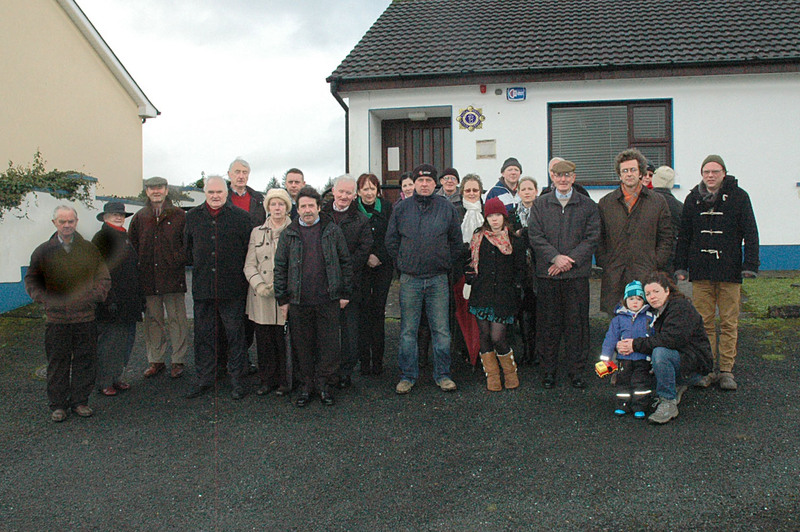 The New Garda Station was opened in 1984 whan Garda Frank Coll and his family moved there from the older station across the road and slightly nearer the village. The previous Garda station had been opened in 1923 having formerly been at Airmount. Click on the thumbnail above to download a larger photo which should open in a new window. Click on the thumbnails above to download larger photos which should open in a new windows. Templeport Development Association has just won Cavan County Council Golden Mile award in the safety & litter free category - from Tonyhallagh (beside Killycluggan Cross) to Bofealon. Jampa Ling also won the best Natural Heritage Mile in the same competition. 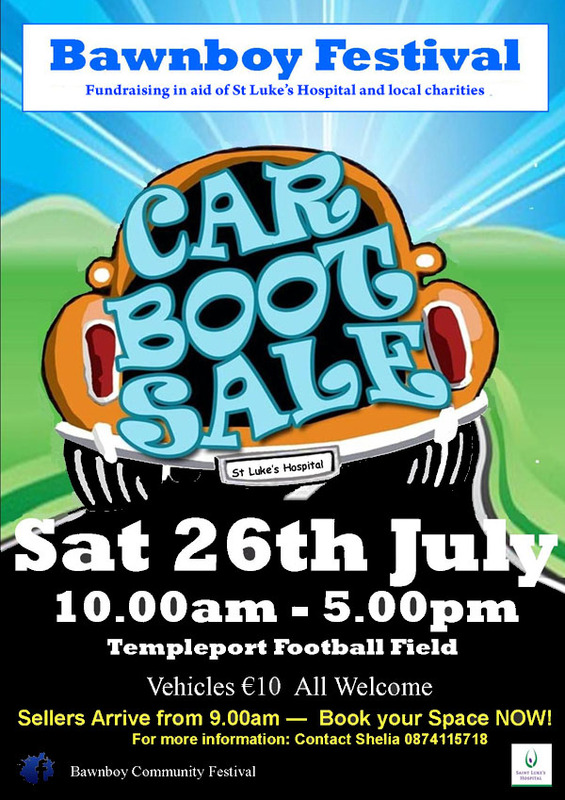 The Templeport Book is now on sale. 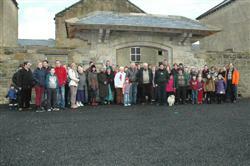 There will be a guided walk around Bawnboy Workhouse on Friday 1st January by Oliver Brady at 2pm. Everyone will be welcome. The next T.D.A. meeting will be held on Wednesday 24th October 2012 at 8.30pm. 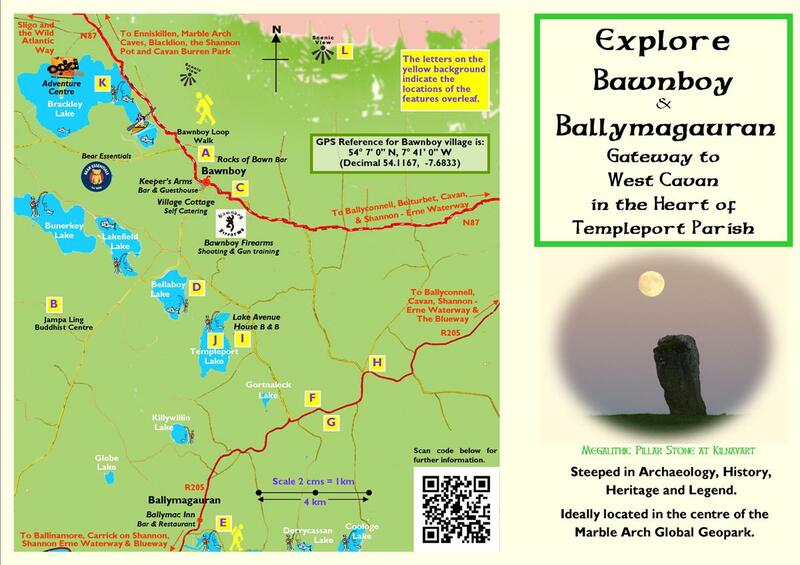 Templeport Development Association is delighted to announce that the official opening of The Bawnboy looped walk will take place on Saturday 8th September 2012 at 12.00 noon. 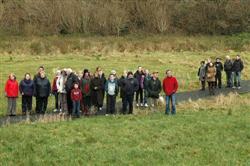 All are welcome to the opening.We hope locals and tourists alike will enjoy this walk for many years to come. The start of the Bawnboy looped walk is located approx 1 kilometre from Bawnboy on the right as you head towards Brackley Lake. Parking is available at the entrance to the walk. The Bawnboy Workhouse committee annual general meeting will be held at 8.30pm on Tuesday 3rd April 2012 . Please will all committee members and directors of Bawnboy Workhouse Ltd attend. This is an important meeting! 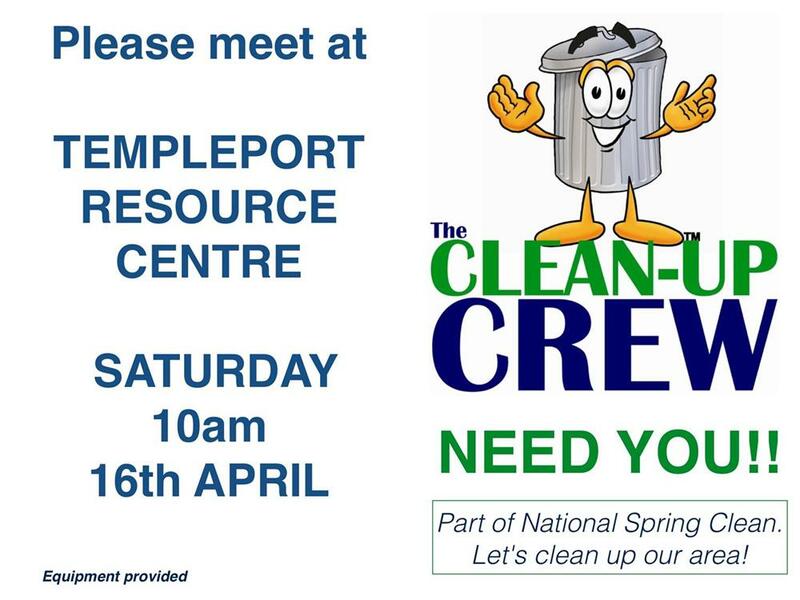 A meeting of Templeport Development Association will be held in the Templeport Resource Centre at 9.30 pm on the same evening, Tuesday 3rd April 2012. The Annual General Meeting of the Templeport Development Association will be held on 23rd February at 8.30 pm in the Templeport Resource Centre. The A.G.M. will be preceded by an ordinary meeting beginning at 8'oclock to discuss damage to the chapel ruin on St Mogue's Island, finalise the boathouse accounts and deal with any other outstanding business. 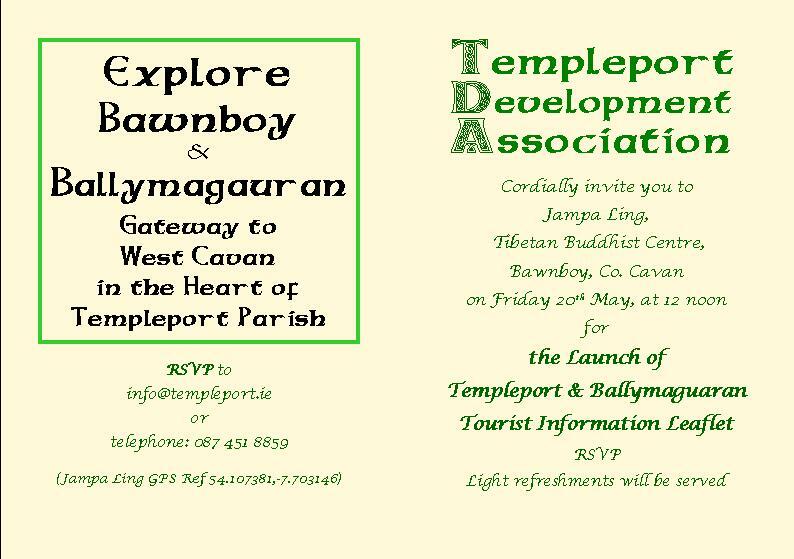 Anyone with an interest in the future of the Templeport and Bawnboy area would be most welcome to come along. Johnny McKiernan Gold and Bronze medal winner at the Special Olympics in Athens will perform the official opening. Boat trips to the Island will be available all afternoon. Templeport Development Association is holding a meeting on Wednesday 5th May 2010 at 9pm in the Templeport Community Centre to set up a committee for the restoration of Bawnboy Workhouse. We hope to elect a committee and to make contacts with grant funding agencies both in Cavan and Cross Border to see what the possibilities are to restore some or all of the Bawnboy Workhouse. 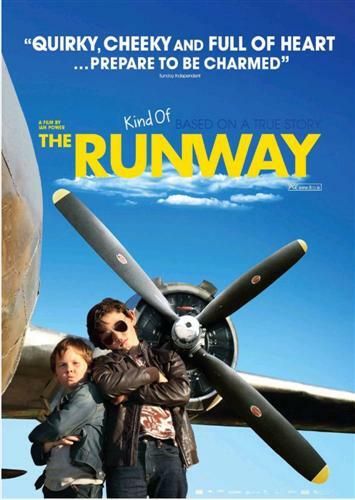 Click here to visit the Workhouse page on the TDA web site. Niamh Shaw, Orlaith Rafter & Isabel Rofé at Bawnboy workhouse on 15th November 2009. 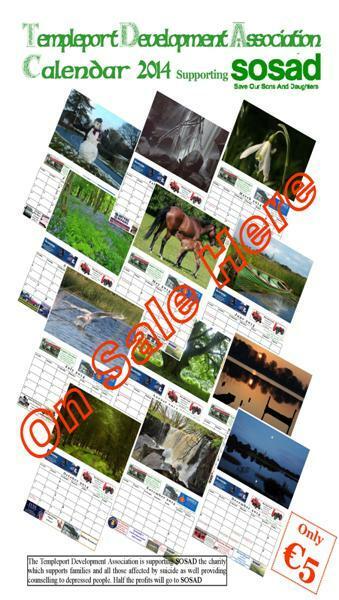 The calendar is on sale in Bawnboy, Ballyconnell, Ballinamore, Ballymcgovern, Templeport and Swanlinbar. 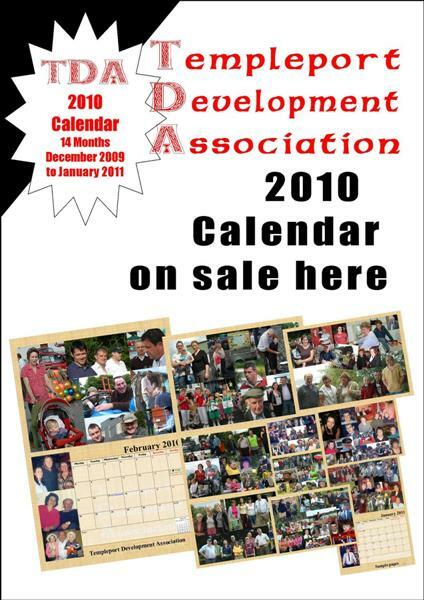 The annual General meeting of the Association is to be held on Thursday 29th October 2009 at 8.30 pm in the Templeport Resource Centre. New members would be welcome to join the association which has already made a most significant positive impact on the area. 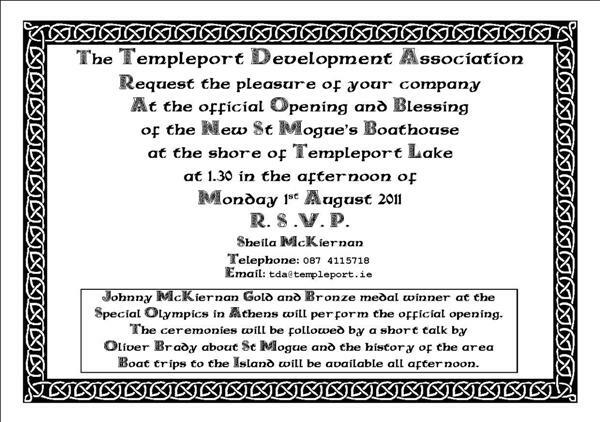 TEMPLEPORT DEVELOPMENT ASSOCIATION is convening a public consultation meeting regarding St. Mogue’s Island in Templeport Resource Centre on Tuesday 28 July 2009 at 8:30p.m. sharp to which all with a particular interest in the island are welcome to attend. Many thanks to all who supported the Fundraising Cake Sale in St. Aidan’s National School, Bawnboy on Sunday 24th May 2009. 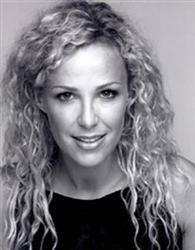 Please click on the photos to see the larger version then use your 'Back' button to return to this page. On most browsers clicking 'F11' will enable full screen viewing. Regrettably the photos which include children at the school can not be published on this site. 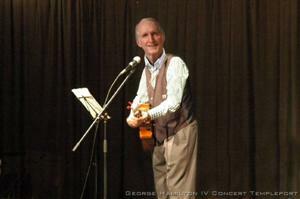 Sincere thanks are due to everyone who came along on the evening of 14th February to Templeport Community for our Country Gospel Concert with George Hamilton IV. George was so gracious in his manner and delighted us all with a selection of good old fashioned country numbers, gospel songs and favourite hymns. What a man, and what a blessing to us all. The evening was organised at extremely short notice as George had a spare night in his itinerary which cropped up unexpectedly. Through his willingness to serve and your generosity we were able to raise just over €1,125 for St Christopher’s Hospice, Cavan. Thanks are also due to the team of volunteers who helped out in preparation for the evening. www.swanlinbar-kildallon.kilmore.anglican.org/group-news/george-hamilton Clicking on this link will open the George Hamilton IV concert photo index page in a new window. Thank you to all those who supported our fundraising 70’s/80’s/90’s Adult Disco in Templeport Resource Centre on 28th December 2008. Your support was much appreciated.